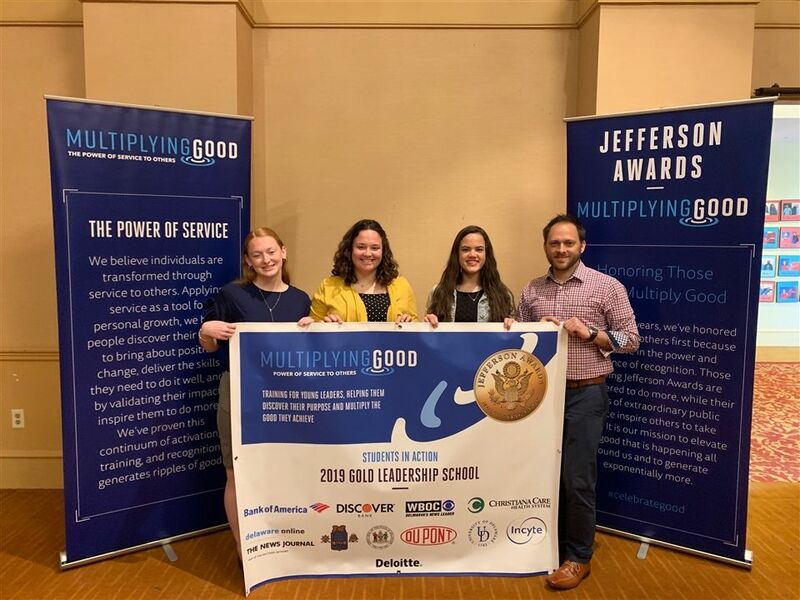 The "Vikings in Action" will represent Delaware at Multiplying Good’s DC Jefferson Awards in Washington, D.C. June 17-19, 2019. St. Elizabeth School was selected at the Delaware Public Service Pitch Day held on April 6 at Early College High School in Dover. They were selected by a panel of judges based on their written and oral responses about how they prepared, investigated, executed, reflected, shared, and celebrated community service. While their actual community impact is phenomenal, their selection is based on their reflection of what they have learned, as a group and as individuals, about leadership and service to others. Participating in the Delaware Public Service Pitch Day were Charter School of Wilmington, Delmar High School, Early College High School, Newark Charter High School, Thomas McKean High School, St. Elizabeth School, and Sussex Technical High School. Together, these seven Multiplying Good Students in Action schools have had a tremendous impact throughout Delaware in the 2018-19 school year: 57K lives impacted, $108K dollars raised, over 29K hours of community service for a combined financial impact of over $840K to the community. Each school was asked to highlight one in-depth service project from the 2018-19 schoolyear. St. Elizabeth High School Vikings in Action (VIA) highlighted their school-wide Day of Service, which took place on January 30th during Catholic Schools Week. VIA planned the projects and enlisted school leadership and the St. Elizabeth parish to allow students from pre-K3 through Grade 12 to participate in service together. By pairing younger students with older students, VIA planned a day for students to participate and learn about service from their peers. The St. Elizabeth school community donated and then packed the following: 135 grab-and-go food bags for Ronald McDonald House of Delaware, 237 grab-and-go food bags for Emmanuel Dining Room, and 148 cold weather bags for Emmanuel Dining Room. They engaged over 530 students and staff for a total of 1070 volunteer hours, impacting over 500 people in their Wilmington community. Along with other volunteer service events throughout the school year, St. Elizabeth’s Vikings in Action have contributed nearly $78K of financial impact to the community. Multiplying Good Students in Action currently operates in over 400 middle and high schools nationwide in 13 regions: Eastern Massachusetts, Chicago, Delaware, Central Florida, Indianapolis, Los Angeles, Minneapolis-St. Paul, New Jersey, New York City, Pittsburgh, the San Francisco Bay area, South Carolina, and Toledo. Each region will select one outstanding high school to represent them at the DC Jefferson Awards in June.